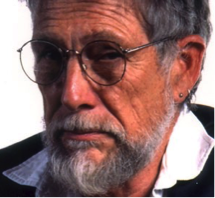 Gary Snyder, now in his 87th year, is a true American man of letters. A Pulitzer Prize winner for his poetry, he is closely associated with the Beat Generation poets and the San Francisco Renaissance of American literature. He has followed the Buddhist faith for many years, translating pieces of ancient Chinese and modern Japanese literature into English. As an ardent campaigner on environmental issues some have dubbed him the “poet laureate of Deep Ecology”. He was born Gary Sherman Snyder on the 8th May 1930 in San Francisco, California into a family with British and German ancestry. This was the time of the Great Depression and the Snyder family took up the farming life in King County, Washington in 1932 for the next ten years before moving to Portland, Oregon. At the age of seven Gary had an accident which immobilised him and he filled his time reading books from the local library. He gained a valuable education from this period of enforced rest and developed an interest in Native American affairs, thus nurturing his own interest in the natural world. At the age of 12 he moved to Portland, Oregon and found a position as newspaper copy boy at the same place where his mother was working as a reporter for the Oregonian. His education was covered firstly at Lincoln High School and then Reed College which is where he penned his first poems which were published in the student journal. He graduated from there with degrees in literature and anthropology and it was at Reed where he first studied the Native American people, in particular research on the Warm Springs Indian Reservation which was located in central Oregon. This inspired him to find work on the reservation and led to a number of poems being published on the subject, a notable example being A Berry Feast. 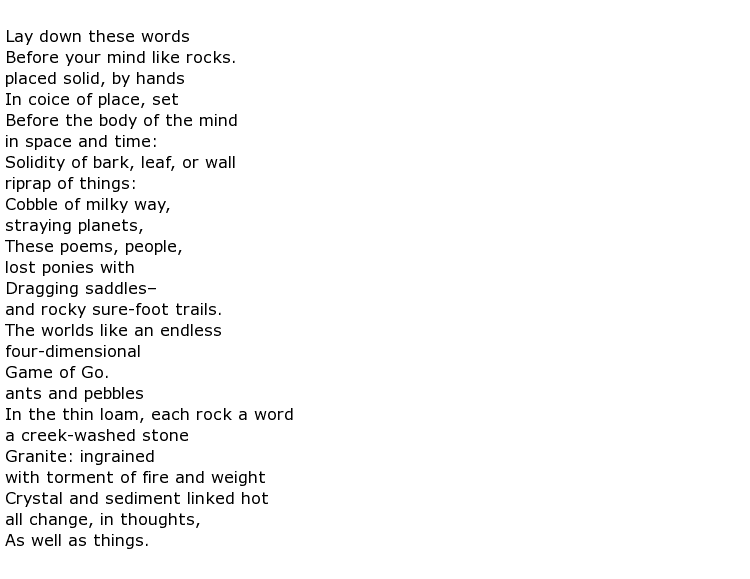 He also got interested in Far Eastern cultures, including Zen Buddhism, and their relationship to the natural world. Snyder went back to education, studying anthropology once more but this at time at Indiana University but this lasted only one semester. He really wanted to become a full time poet and he went back to San Francisco with that intention in mind. He took up with the new “Beat Generation” of poets and was acquainted with the likes of Jack Kerouac and Allen Ginsberg at this time. In some ways he was a bit of an outsider at first because of his “outdoor” experiences which were in contrast to his fellow, mostly urbanised beat poets. Snyder really announced his arrival with this group when he read A Berry Feast at the famous “Six Gallery Reading” in October 1955. Snyder’s keen scholarly interest in Zen quite naturally took him on his travels and he travelled to Japan, learning the language during the 1950s. His return to the west coast took in a number of Far Eastern locations while he was serving as a crewman on board an oil freighter. He had caught the bug though, and returned to Japan many times over the following years.